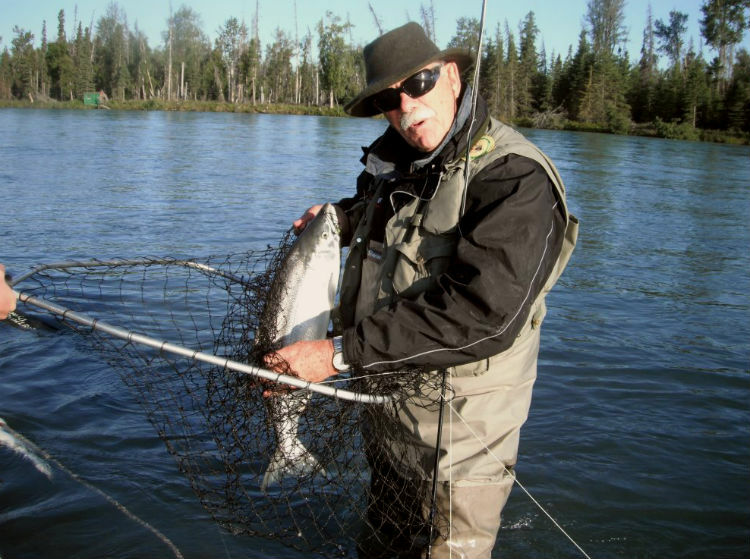 The author seen here with a netted sockeye. Fishing out of the Russian River Campground near the Russian River in Alaska is a ball. Not only is this a great RV park with many other parks in the area, but there are all kinds of fish to go after. During a recent outing, we were catching rainbows, grayling, char and Chinook and were downstream fishing for Sockeye with our guide, Matty. The fishing had been great as we were all pulling in bright salmon from the fast moving waters of the Kenai River, casting with our fly gear from shore. Even with all the commotion, Matty felt his cell phone vibrating in his vest. Checking the number, it was one of his fellow guides and sensing a problem he left the rushing waters and answered. Matty’s drift boat was designed for speed with a sleek shape and a big engine. We all hopped in and within minutes we were at the scene of the accident. One of the guest fishermen, slamming at a fish, had managed to pull his big 4/0 hook out of the river and buried it deep into his lip. The barb was out sight and he looked miserable. Top photo: A barbless hook; Below: a barbed hook. Fishhooks have been used for some 10,000 years or more and a few thousand of those years featured barbs. 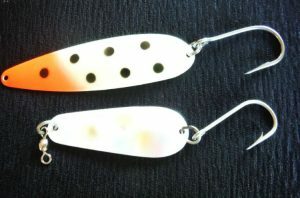 These sharp protrusions near the point of the hook help to hold onto anything that takes your bait. The problem is that if you hook your clothes, boots, or earlobe, it holds on to that as well. This guy had buried the hook so deep that he required medical help to get it out. Most all of my buddies have switched to barbless hooks. Not only do we want to avoid having to work barbs from cloths or flesh, we can more easily release fish we don’t want to keep, helping with their survival. Also, it’s known that you can catch more fish without barbs since the hooks penetrate more easily, and the fish are more often hooked. If you keep the line tight, you will probably end up with more fish going barbless than with the metal assist. If you were setting a long line or leaving gear out overnight like commercial fishermen do, the barb would help hold, but playing a fish is just as easy without the extra chunk of sharpened metal. 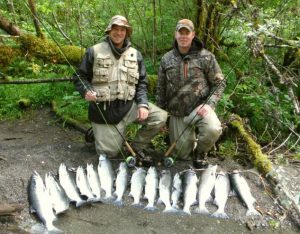 Matt and Gene Greenwald with sockeye caught on barbless flies. If you do get one of the hooks driven into your skin, there is a fairly effective way to get it out. You cut the line off the eye and lay the shaft down on your skin. Then, use a piece of fishing line to slide under the eye and press it against the skin. Then you push the eye and shaft down on your skin, while a buddy pulls the line against the shaft of the hook above the barb, pulling down along your skin. The barb is pulled out along the path it went in. If you are camping with someone who hooks himself and are away from help it can really save the day. However, the best option is to lose the barb, you’ll catch as many fish, avoid problems with snagging yourself and your gear, and have a ready excuse if you lose a catch. All good options! Looks like good fishing but I wonder where on the Russian or the Kenai two people were able to bag 15 fish. I believe the max bag for sockeye is 3 per person per day and 6 in possession per person.. Trout and steelhead is one fish. I’ve seen Fish and Game extend the bag on salmon to 6 fish a day, but no more, and this is generally a rare occurrence. Good Call. These fish were taken in Yakutat on the Situk river (as the picture was better than those I took on the Russian and Kenai). The river is about the size of the Russian. It gets a lot less pressure than the Russian River area. The big catch was the result of three people fishing and they actually quit early since they had a long hike down the river to get the fish back to their rig. The limit there was six sockeye, plus pinks, plus Dolly Varden. A big limit but not much pressure there and all kinds of fish. Kenai limits are three fish, as were limits on the Russian when we fished there this year. The first picture shows me on the Kenai, a lot larger river than the Situk. Many people there use giant hooks, including the barbed monster 4/0 that the guy in the story managed to jerk into his lip. In the smaller waters we were able to see the sockeye actually swim over and gently take the small flies we were casting. We certainly disproved the theory that sockeye won’t readily take a fly.